These little babies caused a lot of controversy in the house! The controversy was over who liked them and who didn't! I have seen them around the blog/recipe circuit and decided to give them a try with the kale that was left over from the fruit bouquet (I don't waste food). I gave them a good washing and drying, cut out the thick stem, sprayed them with a little cooking spray and sprinkled them with a little salt and pepper. Then I placed them in a preheated 350 degree oven for 15 minutes. I loved them! They are very interesting in texture. Not really a dipping chip for a thick dip like hummus, but you could absolutely use ketchup. They would be great on a salad too, if you like the crispness of croutons on your salad! The illustrator, was not a fan...to say the least, but I absolutely loved them! This was a delicious lunch of my huge plate of kale chips (yes, I ate the whole plate in one sitting) and some grilled zucchini with sliced farmer's market tomatoes. 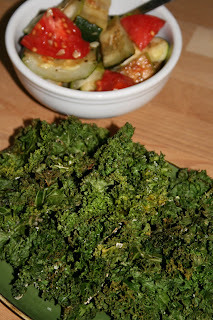 I can't get kale so I've only ever had Silverbeet (swiss chard) chips, but I loved them! And so did the kids surprisingly. The husband not so much. I keep hoping that one day I'll find kale here so I can give them a try. They're awesome! I made kale chips once, but the "recipe" I followed called for waaaay too much salt. They were pretty well inedible. I think that turned me off from trying them again, but your pictures are making me rethink it! 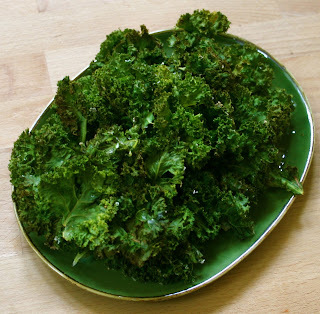 Never tried kale chips. Kind of unusual!